Product #3832 | SKU Z-ESM | 0.0 (no ratings yet) Thanks for your rating! The EVF Standard Mount is used to mount the EVF onto the Zacuto DSLR Baseplate. It includes a 4.5” F/F rod that attaches to 15mm rod hole on the side of the DSLR Baseplate and a Z-Mount Zwivel. The Z-Mount Zwivel is a 15mm to 15mm rod connector that allows you to attach a vertical rod to the horizontal rod coming out of the side of the DSLR Baseplate. 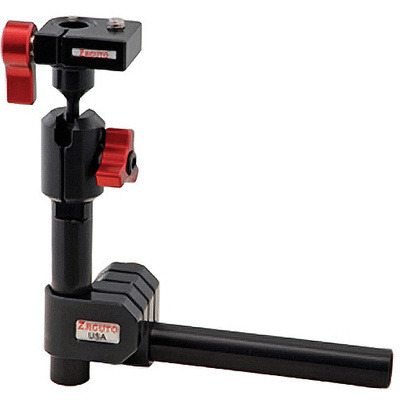 Attached to the vertical rod is a pan and tilt mount with Zacuto’s Zicro Mini. This allows you quickly release the EVF from the EVF Standard Mount with the flip of the lever. The pan and tilt allows you to adjust the angle of your EVF to the desired position. If you are looking to mount the EVF to another manufacturer’s rig check out the EVF Rod Mount (Link to EVF Rod Mount here).